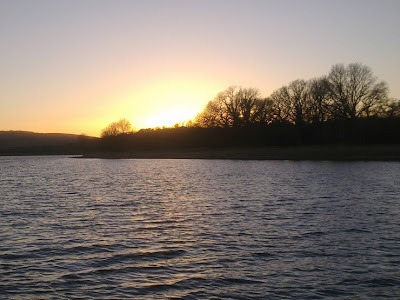 I journeyed to Chew Valley as a guest of Sean Geer from Fishmail. I had been invited in January and was counting down the days like a kid waiting for Christmas, I've been reading anything I can get my hands on about the lake and looked at the big collection of thirties in the angling press. 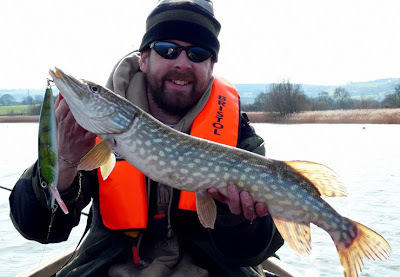 So yesterday, armed with my Mimics™ (post below) and my giant pike-plugs, we were out on the water by nine o'clock. I know it's sometimes referred to as shooting fish in a barrel, but this is a very big barrel. And the conditions weren't great. 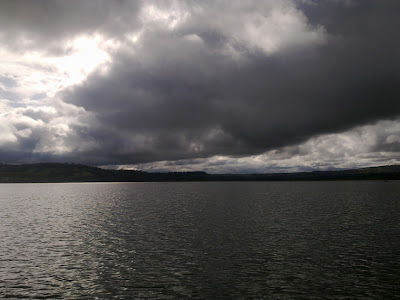 The moody sky soon turned into bright sunshine and the deadbaits remained ignored and the lures untouched for the first two spots we tried. The third spot we tried produced a take on the pike-plug - something was feeding. And the next cast produced the 3lb pike above. This was followed by about 20 minutes of action with several fish hooked (all on the pike-plug) but none landed. When this action dried up and we up-anchored and went searching for another fish. We fished a number of spots but nothing was playing and we didn't see anyone on the other boats into a fish. It didn't matter to me, I knew at any moment a float could sink or my lure might swim past a thirty pounder. But time was flying by and I was starting to think the 3 pounder was going to be the only fish of the trip when my pike-plug was snapped up out of the blue. It was a bigger fish, they aren't known for being hard-fighting fish but she looked like a double in the water. 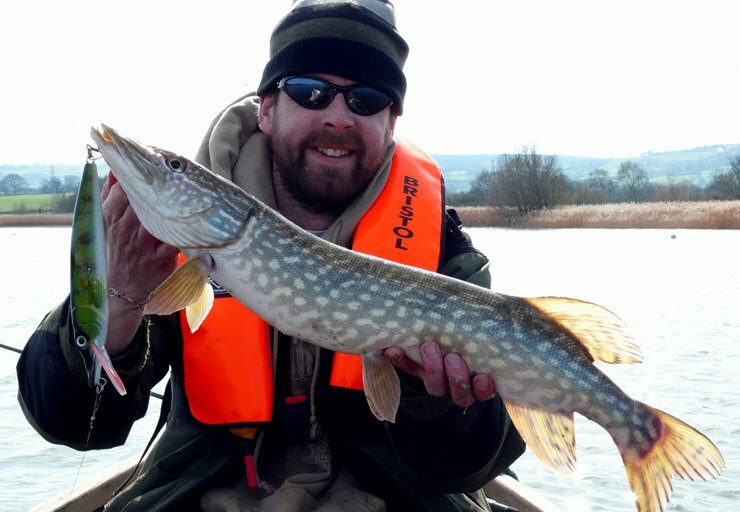 When we got her in the boat you could she was a lot bigger fish - a typical Chew pike, small head and a massive body - and went exactly 17lb. Delighted! We fished on into the sunset without another touch. It was a tough day and when we got back to the boat house we learned that most people had blanked, only a couple of other jacks had been reported. 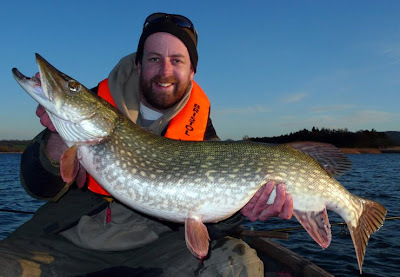 I wonder if my fish had taken the pike-plug out of aggression on a day when nothing was feeding? So it's a great big thank you to Sean, I had a fantastic day. And thanks for putting me on the fish in very tough conditions. And I will be back for a Chew Valley thirty..! What a fantastic fish! A big pot bellied trout eater. Not too lazy to run a plug down though. Well done!! They are really beautiful pike, very different to Wye pike, with there small heads and distinctive markings. They are had work and they aren't great fighters but it's fantastic fishing. Just knowing there are a big number of thirties in the lake makes you keep the lure working all day. We didn't have a run on the dead baits but I'd imagine the excitement of watching the float being pulled under would be one of the great fishing experiences. Paddy, it's open to pikers a couple of months a year, normally October and March. You have to apply for tickets before 1st January. And due to a lot of interest, tickets are issued on a lottery system. I'm going to look into it and apply next year.